Seawatching has been gaining popularity in recent years, whether watching from traditional coastal sites or from boats while on specific 'pelagic' trips in search of seabirds, dolphins and whales. Many seabirds will only be seen in flight, as they pass by prominent headlands or fly past boats, and viewing opportunities are frequently brief. 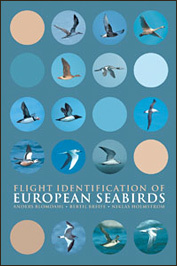 This book is the essential field guide for seawatching, specifically designed to address the particular problems and limitations with this kind of birding. Welcome to discover this wonderful world as seawatching offer! Order the book directly from Bloomsbury or Amazon. November 2012: Second reprint of the book since its release in spring 2003. Unfortunately it will be no revised edition of this book. December 2011: Out of order once again. Reprint is under consideration as well as a greatly revised edition. The future will tell. During summer 2006 the final copies of the English original edition sold out, after only three years on market! However in spring 2007 the book was reprinted and since then has been available on the market again. It is important to note that this is not an updated second edition, just a reprint, however the good news is that in addition to a nicer front cover design and a lower price, the publisher has tried to re-work all of the photographs! This website is managed by Niklas Holmström, Sweden.